Early pictorial map o Vichy, France. Carte Hydrologique Pittoresque et Routiere des Environs de Vichy (Allier) a l'usage des etrangers qui frequentent cette ville pendant la saison des eaux. A stunningly decorative c. 1865 pictorial map of Vichy, France and its environs. In the 19th century Vichy was a station à la mode in the Auvergne attracting a constant stream of celebrities, dignitaries, and elites with its picturesque chateaux, thermal spas, and fine weather. Vichy's prosperity eventually drew the attention of Napoleon III whose patronage from 1861 to 1866 lead to an extension of the railway from Paris to service the town directly. 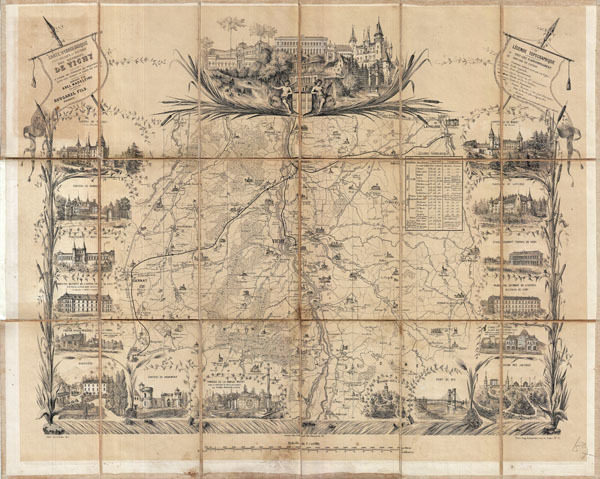 This map, clearly designed with tourism in mind, illustrates Vichy and its vicinity in a spectacularly decorative fashion with engraved border vignettes highlighting popular tourist sites including various chateaux, tombs, bridges, monasteries, and of course, the region's hallmark thermal spas. Very good. Dissected and mounted on linen in 18 sections. Front cover of original binder detached and missing. Light soiling bottom center.